The Student and Emerging Professionals Committee presented the CAA Board of Directors with a recommendation on behalf of emerging professionals, requesting a reconsideration of the emerging professionals’ membership dues and registration fees to accommodate their challenging financial situations. Ongoing projects include expanding on and revamping the committee’s website, and establishing a volunteer project that allows students and emerging professionals to be more involved at the CAA Annual Conference. In accordance with the guidelines established for CAA Professional Committees, the Student and Emerging Professionals Committee is made up of a minimum core of eight students or recently graduated CAA members selected by the CAA president and vice president for committees from an open call published in CAA News and on the CAA website. Students in BA, BFA, MA, MFA, and PhD programs and recent graduates in art and art history will be represented. Members serve a three-year term and must be no more than five years beyond graduation from a degree program. A board member will serve a three-year term as advisor in order to provide continuity and guidance for the long-range goals of the committee. The purpose of the Student and Emerging Professionals Committee is to serve better the varied needs and concerns of student and emerging professional members of CAA, and to encourage students and colleagues to join CAA. The committee will disseminate information and solicit participation from students and recent graduates from universities with BA, BFA, MA, MFA, and PhD programs in art and art history throughout the United States. As a standing committee, the Student and Emerging Professionals Committee will have the opportunity to propose two sessions for the Annual Conference and hold its annual meeting at the same time. Other activities will include developing material for a page on the CAA website, organizing workshops at the Annual Conference, and addressing issues such as dissertation writing and MFA theses and/or theses exhibitions. Often, incoming MFA, MA, and PhD students are only aware of CAA as a career-placement service; however, the numerous other services CAA offers can benefit students before they begin their search for full-time employment. CAA can provide visual artists and art historians access to a whole network of opportunities. 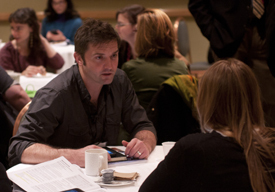 CAA’s Annual Conference is the only national forum for visual arts and art history. Each year in a different location around the country, artists, art historians, curators, educators, and arts administrators convene to present current research, review trends, exchange ideas, and address issues within the profession. 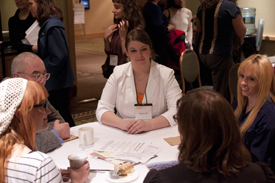 At the Annual Conference, various workshops prepare students to enter the job market. The Artists’ Portfolio Review offers artist members the opportunity to have slides, digital images, DVDs, or VHS videos of their work reviewed by professional curators and critics in private, twenty-minute consultations. Career Development Mentoring offers a unique opportunity to receive candid advice on how to conduct a thorough job search, present work, prepare for interviews, and write effective CVs and cover letters. The prestigious Professional Development Fellowship Program bridges the gap between graduate study and professional careers by providing financial assistance and career placement for outstanding students who have been marginalized in their field. CAA publishes two distinguished quarterly journals, The Art Bulletin and Art Journal, and CAA News, a weekly email newsletter. The CAA website provides detailed information about the organization, including frequent updates on advocacy issues that affect our membership; it also includes a link to caa.reviews, an online publication devoted to the critical reviews of books, exhibitions, and projects in all areas and periods of art history and visual studies. Members also have the opportunity to join CAA’s diverse and increasingly active Professional Committees. These committees address specific issues relevant to visual arts and art history such as professional practices, women in the arts, international concerns, and cultural diversity. The Student and Emerging Professionals Committee aims to serve better the varied needs of student and emerging-professional members of CAA. The listserv was established by the committee as a forum for CAA student and emerging-professional members to communicate with other student artists and art historians throughout the country. We created the list as a means of communicating information about fellowship opportunities, calls for papers, calls for submissions to exhibitions, advocacy updates, national and regional art events, student concerns, and conference information such as ride sharing or hosting a student in the conference city. If you wish to participate in the CAA Student and Emerging Professionals Committee listserv, send an email message to STUDENTMEM-L-SUBSCRIBE-REQUEST@listserv.collegeart.org. Do not type anything in the subject line or message body. This is a special-action address and will result in a subscription.